The Anti-Terrorism Court (ATC) on Monday issued non-bailable arrest warrants against Shahrukh Jatoi, the key accused in the Shahzeb Khan murder case. It also handed over three accused, including prime co-accused Siraj Talpur nominated in Khan’s murder case, to the police custody for 10-day physical remand. Khan was gunned down on December 25, 2012 in Karachi and following the incidents, Chief Justice of Pakistan Iftikhar Muhammad Chaudhry had taken a suo motu notice and ordered the inspector general of police of Sindh to produce the accused before the court. Following the Supreme Court’s order, Sindh police had conducted several raids across the province and arrested from Dadu accused Siraj Talpur, Imdad Talpur, Sajjad Talpur and Ghulam Murtaza Lashari nominated in the murder case. On Monday, police produced Siraj Talpur, Sajjad Talpur and Ghulam Murtaza Lashari before the anti-terrorism court. 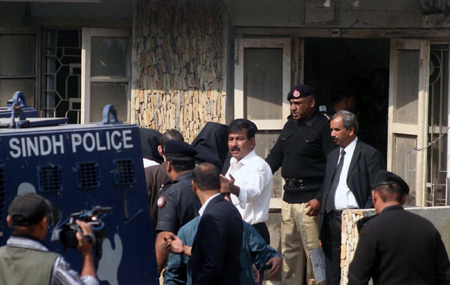 Judge Ghulam Mustafa Memon of the ATC-III sent them to prison on physical remand till 17 January. Moreover, the court also issued non-bailable arrest warrant against Shahrukh Jatoi, who is on run since the Khan’s murder, and also against his father Sikandar Jatoi. The court also ordered investigation officer to produce them before the court for remand as early as possible. SHC grants status quo on LEW affectees petition: The SHC on Monday restrained the official respondents from demolishing the houses of petitioners in connection with Lyari Expressway (LEW) project. The petitioner cited province of Sindh through chief secretary, commissioner Karachi, administrator Karachi Metropolitan Corporation (KMC), project director Lyari Expressway, Federation of Pakistan through secretary of finance, and station house officer of Liaqatabad police station as respondents. The petitioner Muhammad Hanif and 31 others through their counsel Shaukat Ali Shaikh submitted that they were settled in Liaqatabad, and KMC and KDA had also registered their plots and granted them registered lease from the year 1966 and later on. They stated that respondents were trying to demolish their houses for Lyari Expressway project without paying any compensation. They submitted that respondents were not willing to pay compensation amount according to valuation of their property. They said that respondents were giving them Rs10,000 per square yard but they wanted 50,000 per square yard besides the price of construction. They submitted that respondents had started acquisition work in year 2002 and one side of road was completed in the year 2006. They said that now once again work on Lyari Expressway had started after the delay of six years and respondents were paying same compensation, which was decided in 2006, which according to them, is violation of the acquisition rules. They said that respondents had still not paid compensation to those householders whose property was acquired for the project in year 2006 and was demolished without paying compensation. They prayed to court to direct the respondents to pay the adequate compensation amount as per value of property before demolishing their houses and restrict the respondents and their agents from the demolishing their houses.